Chris Graham, the President of MoreBeer joins me this week to discuss brewing the perfect Bohemian Pilsner. Bohemian Pilsners are one of the more challenging lagers to brew, but Chris provides some great tips to get started with this great beer style. 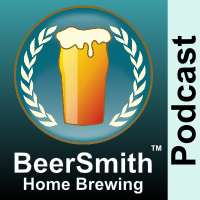 My guest this week is Chris Graham who is the President of MoreBeer – a major home brewing equipment provider. Chris is also a former AHA governing committee member, former Brewer’s Association board member and long time brewer. Chris tells us why Bohemian Pilsner is a tough beer to brew for beginning brewers, and why it requires a bit of experience. We talk about the grain bill, the importance of using Pilsner malt and also why all grain can produce a lighter Pilsner than extract. Chris talks about the mash profile for a Bohemian Pilsner including the traditional decoction mash. We discuss why Saaz hops is the traditional choice for this beer style. Chris explains his preference for yeast, as well as his preferred fermentation profile for this beer. We talk about why its important to pitch plenty of yeast with a lager.